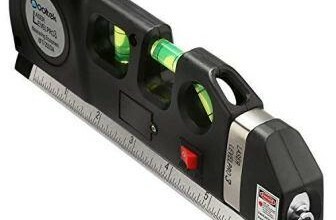 The laser‘ Tacklife SC-L01’ is among the ultimate laser tools of line levels that we have reviewed. This tool has a projection range which is lengthy i.e. 50 feet. It has most of all features for leveling that we had been searching for combined with an accuracy ±1/9th an inch. Nevertheless, its lack of options for mounting as well as relatively short battery period (of 12 hours)has become obstacles for making it our number one pick. During the testing of ‘Tacklife SC-L01’, it performed splendidly well. At 30 ft, its accuracy was ±1/9th an inch. It is able to project a strikingly visible line while operating at its utmost maximum range as well. It also possesses a feature for auto-leveling which works within 4°. In case this tool is placed out of the 4° level, then you will see the laser beam blinking continuously till you bring it within its range. You will be sure that your accuracy, as well as level, is correct if you observe a stable red cross projected on your wall. It is very simple to mount this particular laser level. Below the tool, there’ll be a thread which fixes the tool to mostly all tripods, commonly available. Also, it is accompanied by a strong mount that is magnetic which fastens to surfaces of metal. Although these are good advantages, they have a limit. A few of the laser levels introduce adhesive mounts, suction-cup, and clamp. Any such one or additional options would bring about an increase in utility of the device. The ability of this device to project the laser line is maximum up to fifty feet. However, you can decently rely on it to provide good results up to approximately 30 feet only. The farther the distance makes the laser get blurry and diffused. This phenomenon is most common while using laser line levels compared to ours, however, it’s still not useful. Although this device isn’t listed as one of our ultimate value picks, nevertheless it is a device that will provide you with great benefits. Period of warranty of the tool is 2 years, this is the average period given to laser line levels that we tested till now. Some brands like Johnson, HAMMERHEAD, and DeWALT provide a 3-year warranty. However, the warranty period shouldn’t become a reason to stop you from picking this great device. When switched off, the pendulum locks. As the pendulum gets unlocked it activates the laser beam. 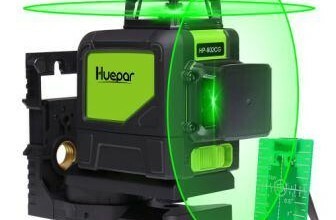 This automatically levels once positioned within a range of 4° of the vertical/horizontal.In case it is out of the specific range, then there is auto-flashing of laser beams as an alert signal. The manual mode is started by pressing the top button, this allows further locking of lines in order to align with other respective angles. Mounting of the laser level is easily possible upon a tripod. Also, fixing onto metal surfaces with the help of a magnetic bracket is an option. 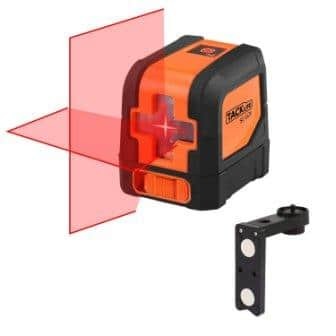 This provides support so you are able to rotate your laser level all-around for 360°,adjustment of height with the tripod thereby making the projection of lines possible in any angle or position. 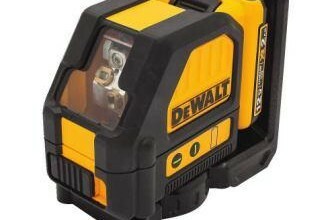 This laser tool emits cross line projections on top of flat surfaces at a distance of 30 feet accompanied with great accuracy which is ±1/8 an inch. It works the best indoors. It is perfect for the alignment of tiles, doors, windows and wall studding, etc. It is a laser product of Class II type. Has an Output of less than 1mW. This tool is lightweight and compact, which makes it easy for gripping. However, it is sufficiently big to be seated stably. It is accompanied with a pouch which isa nylon zippered type. This prevents dust when stored as well as protects the tools’ level and the L base from any scratch or impact. The soft type of carrying bag or case: This case fits both the arm used for mounting and the tool itself. It is very useful to carry as well as for storing. It protects from dust too. The tools’ L base (magnetic) is simple to adjust for a mounting base having of quarter 20 thread for mounting which can fix to studs or steel surfaces, this aids in its versatility for its use in several applications. Direct usage: It is powered using 2 nos. of AA batteries that are accompanied by a box. This lets you use it immediately. It has safety transportation, which means the locked pendulum protects the laser against shifting off level or plumb while it is transported. This mode aids in projecting the red laser beam cross when placed within4°any side of the true zero. If not it will constantly flash until it levels itself. You can press the tools’ button that is present on top of it in order to deactivate the mode of self-leveling. Further, you are able to use it at any respective angle placed on the tripod once the beam flashing in every 5 seconds stops. 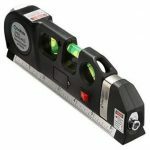 ‘Tacklife SC-L01’ is highly accurate ±1/8 an inch, at a distance of 30 feet, it works well indoors too. Its operation is best situations of less light. However, in case it requires to be used outdoors then this laser would get affected by the intense sunlight. The tools’ combined magnetic type of pivoting base with a quarter-inch thread offers an even attachment onto tracks of metal and steel. During the operation, you need to be careful to not get your eyes exposed to the laser beam that is emitted from the tool (i.e. the source of red light). The exposure for a long period of time to any laser beam is rendered as hazardous to the eyes. This is a red laser beam, however, there is a 7-color combination in the light of the sun. This beam of laser gets reflected on to an object of a target which is further reflected, to be seen by the naked eye of a human. At a farther distance, the energy of the projecting laser becomes weak thereby making its light darker. When the laser is used outdoors, then the strong sunlight, as well as its brightness, becomes a lot brighter than laser’s brightness. Hence, the sunlight tends to disturb human visibility allowing you to only see the white light that the sun reflects, this results in an invisible line of the laser over the specified target. This is similar to using the incandescent lamp in an externally lit environment, where you can clearly only see its glowing wick, but will not be able to see its illumination to the other places as well. ‘Tacklife SC-L01’ works very well. The device is durable and accurate. It possesses almost all the features that we need under this specific category. Although, it does lose a few points due to its brief battery life span, and restricted mounting alternatives. However, overall, the device is great and has not left us much to dwell on or complain over.